Brenda Niall's biographies characteristically begin with simple and enigmatic stories, whose significance becomes clearer as the book develops. This sympathetic exploration of her grandmother's life takes its point of departure in two of her possessions. The first is a wooden box made for Aggie Maguire by her brother as they sailed from Liverpool to Australia. In 1940 she gave the box to Brenda. 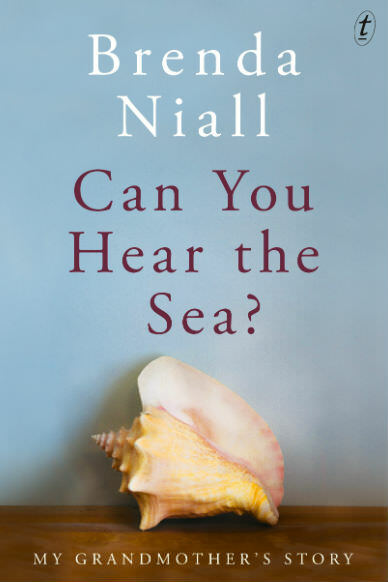 The second item is a conch shell with which Aggie entranced her grandchildren, asking them, 'Can you hear the sea?' For children who grew up in the Riverina, it evoked new horizons. For Aggie it evoked memories of the Liverpool of her childhood. Aggie's story is rich in its detail. She lived through and was touched by the large events of the day, always at pains to mark out territory of her own so that others would find there space to play and grow. She was one a large family of Irish immigrants to Liverpool who had begun to better themselves. One of her brothers became very wealthy and later owned an Irish castle and horse stables. In 1888 she came to Australia with her sister — also a teacher — and with her tubercular younger brother Joe to begin a new life. Joe died at sea. The sisters began schools and found employment as rural teachers. Aggie met and married Richard Gorman, a member of a large Irish immigrant family like her own, who had prospered and taken up land in the Riverina. Her challenge was to carve out for her family a space that was not simply an appendage to the Gorman dynasty. She insisted that she should be given away in marriage by her uncle in Melbourne and not in the Riverina as the Gormans wanted, and that the family property should be properly defined, giving her space from a critical and powerful mother in law. Her independence of mind was expressed in naming one son Nugent after the radical Liverpool priest James Nugent, and another after Piet Joubert, the Boer general in the Anglo War. Her domestic world unravelled in 1908 when her husband fell ill and died of a painful and disfiguring disease. She moved to Melbourne with her family to care for him, and later moved back to the Riverina where she felt both the generous support and the presumption of her husband's family. This came to a head in the Great War, in which families were divided by the attitude they took to the war. Her brother in law, a notable local figure, wrote to her son Jack telling him he should enlist. Jack was a pacifist, but was prepared to serve as stretcher bearer, a lethal occupation. Aggie was overcome with helpless rage, but through her Maguire connections found him a place to serve in England with the Canadian medical corps. "It is hard not to see in Aggie's gift the closing of a period in her own life and the opening of another period in the lives of her grandchildren." In 1929 she visited Liverpool again and holidayed by the sea at Hyères where she found the conch shell. She returned to the Depression in which she lost her investments, lived for a while in straitened circumstances with her sons in an isolated Riverina farm, but returned to Melbourne to dedicate herself the education of her grandchildren. In Melbourne she could provide a home away from home for her grandchildren in boarding schools, making a space that was safe for them and their friends, always welcoming and respectful. In 1940, Aggie gave her granddaughter the box that Joe had made over 50 years earlier when they were leaving Liverpool. The box had recently been broken into in a robbery. In 1940, too, Liverpool was incessantly bombed. It is hard not to see in Aggie's gift the closing of a period in her own life and the opening of another period in the lives of her grandchildren. In the 1930s Russian purges, a woman queuing in the snow outside a Moscow gaol recognised her companion, the poet, Anna Akhmatova, who also waited for news of relatives. 'Can you describe this?' she asked. The exigent question put Akhmatova on the line as person and poet. She replied — and both her poetry and her life testified — that she could indeed describe it. In a mercifully more domestic and pastoral context, Aggie's gift of the shell and the empty box put two questions to Brenda Niall. They also addressed her craft and her desire. Could she recreate the sounds and feel of the past out of unpromising materials, and could she fill the empty box while recognising that it remained empty? This book answers both questions with assurance. One might hope that among the next generation of Aggie's descendants another young person will hear in it the sea that flows into story telling. I was fortunate to be tutored by Brenda Niall at university and, from reading this review, look forward to reading her latest literary offering. One of my granddaughters has, as her middle name, my Christian name. She reminds me of that on occasion and my hope is for her to remember. Also, I have great hope for their lives to be filled with compassion for others and to fully achieving their potential. This article reminds me to share my stories with them.